Duck Walk is a challenging exercise that not only builds your quadriceps, hamstrings, glutes and calf muscles but also develops flexibility in the hips and legs. 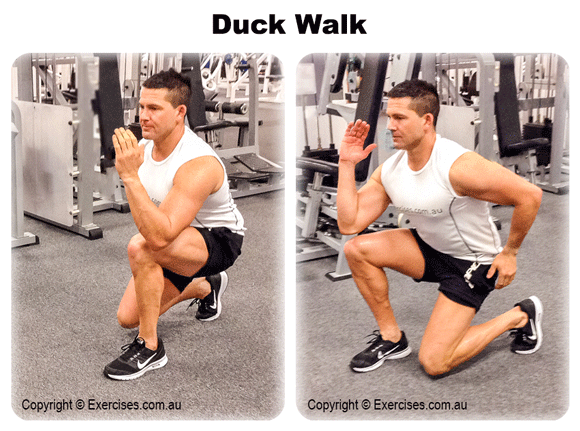 Duck Walk is a great addition to your exercise mix if you are training for sprints and wrestling because both sports require hip and leg flexibility. It can also be used as a warm up before leg training. Do as many Duck Walks as you can in 30 seconds or one minute for 3 intervals. Stand in a shoulder width stance then drop to a full squat position; keep your back flat and knees over your feet. Move the right leg forward keeping the foot flat on the floor while the left leg trails from the back and on the balls of its foot. The left arm swings forward to ear level while the right arm swings back to hip level. Alternate moving one leg after the other with the arm opposite the forward leg swinging back and the other arm swinging forward. Duck Walk follows your body’s natural motion while running except that you are doing it in the bottom position of the Squat. Duck Walk requires you to maintain the same mechanics when you are sprinting; arms swinging close to your hips and up toward ear level, back leg on its toes and front leg with the foot moving from ball to toes. Most importantly, with Duck Walk, the knees are always near chest area. One of the basic principles in sprinting is keeping your forward knee high to the chest.